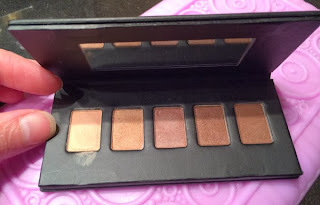 THE SKINNY: The new eyeshadow line (and palette) from Julep reminds me of the Urban Decay Naked Basics palette. The small palette contains a great mix of neutral colors that blend with each other or other shades to create a simple or smoky look. The Julep Sweep Eyeshadow Palette is a great addition to the ever-expanding Julep line. Every color -- there are five in the palette -- is beautiful and goes on smooth. With primer, the shadows tend to last as well as any others that I use regularly. I only wish the case snapped shut (it is magnetic) so I could toss this small palette into my bag. CHECK IT OUT: See the palette for yourself or join the Maven program to get goodies in the mail each month.